A PhD student at the Royal College of Art in the UK has come up with a very unique use for rapid prototyping. First: rapid prototyping is used in industrial design to create physical models of computer-aided designs (CAD). (See Wikipedia entry). Machines can be used to "read in data from a CAD drawing and lays down successive layers of liquid, powder, or sheet material, and in this way builds up the model from a series of cross sections. These layers, which correspond to the virtual cross section from the CAD model, are joined together or fused automatically to create the final shape. The primary advantage to additive fabrication is its ability to create almost any shape or geometric feature." Now here's the incredible part. You're a parent about to have a child. You go in for an ultrasound. Nurse says the baby's fine. Only issue is that you're blind. You have to take his word for it? 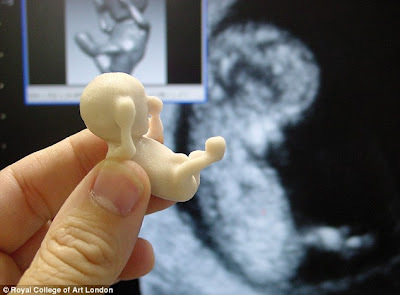 Nope, what if he places into your hands a life-size model of the fetus? Can you even begin to imagine how kewl this is??? Now there are thousands of other applications for this: modelling fetal emergencies to prepare for in-utero surgery... hell, any kind of invasive surgery. I'm just completely blown away by all the potential applications. Check out the article on The Daily Mail for examples including conjoined twin surgery. Do you know of any kewl industrial design tools or methodologies that have benefitted the medical world? What do you think about this one? Leave a comment!